Well wow, all I can say is that I’m flattered that there are real life DFV’ers actually requesting one of my recipes. I wasn’t out to become an internet star, I was just feedin’ my girls. Like almost everything else I do in the kitchen I have a template from elements of recipes I’ve used over the years I’ve spent becoming the house pancake master, then make whatever we have in the kitchen work within that template. This is what I had to work with this weekend. Mix everything except for the white chocolate chips together in a large bowl until you have a thick batter. Using a 1/4 cup sized measuring cup, fill the cup half way with batter, sprinkle in chips, top off with batter, then pour on to the heated greased griddle. It takes an extra effort to do it this way but I found using a 1/4 size measuring cup is a great way to curb my super-size it tendencies, and by mixing the the chips this way puts them in the middle, melting them nicely, instead of burning on the cooking surface. I use vegan butter to grease the griddle. Had I done it right it would have been served with a mimosa but it was kinda spontaneous so…..next time. Makes about 15 pancakes @ 6 inches across. Gallery | This entry was posted in breakfast, Felipe's corner. Bookmark the permalink. where did you get the vegan white chocolate chips? In Seattle we get a brand I think called Sweet Treats at Side Car for Pigs Peace. If you’re not in Seattle there is this brand available on Amazon. 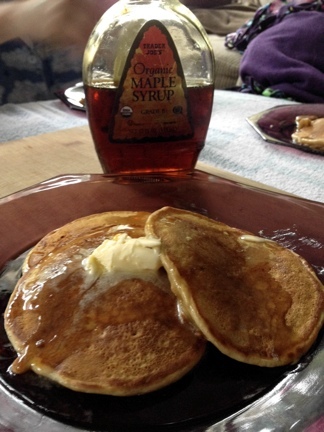 These look delicious…I can never get my pancakes to turn out right, but I’m going to have to try these ones! They are the best I have had. It’s hubby’s favorite thing to make!